Amongst the many intriguing stories of mighty warriors, corrupt Emperors, and plotting concubines during the magnificently tumultuous era of the First Dynasty in ancient Hiangsha, the indisputable favorite is a legacy that remains mysteriously vague and controversial to this day. A tale of heroism, of bravery, and magic. The events most commonly approved by historians detail the achievements of a legendary female general, Mi Fan. Well-loved and even worshiped by peasants and soldiers alike, General Mi’s thrilling battles plans and conquests passed down through the generations in songs, poems, and plays. She won countless battles against great odds and helped unite a divided Hiangsha, retained infallible dignity in face of the most trying circumstances, and most famously, assisted the Revolutionist Party to overthrow the corrupt third generation Emperor, bringing peace and order to the beginning of a just and prosperous era of the Second Dynasty. However, perhaps due to the superhuman quality of her strength (both in physical prowess and mental intelligence), whispers of her ‘alternative identity’ quickly spread across the nation since as early as her own time. Many people claim to have seen her dressed as a humble baker, travelling across the many provinces and appearing sporadically on the street markets, selling irresistibly delicious custard buns. Others recount strange tales of the general in pursuit of mystical adventures of the most exotic variety, defeating ghosts and demons, lifting terrifying curses, and even erasing malignant spirits and ideas that have been plaguing families and villages for centuries. 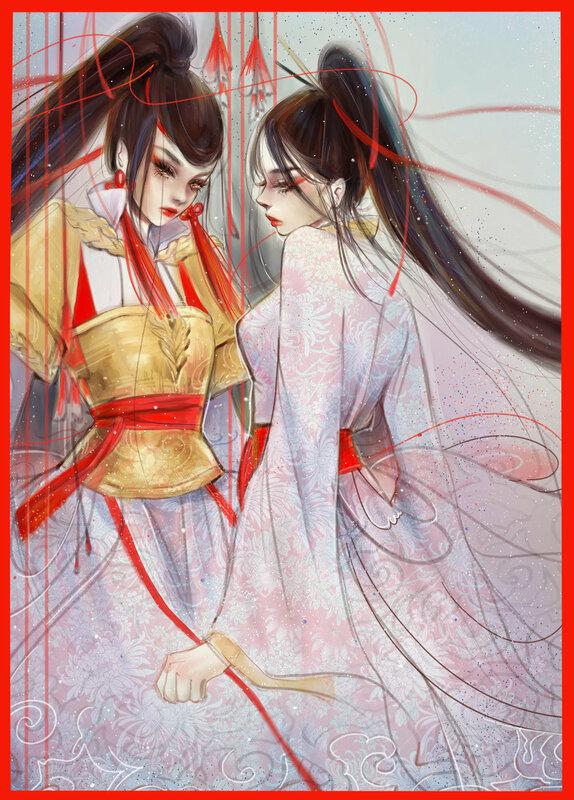 This mysterious character with an identical appearance to General Mi would be spotted dressed in the most peculiar clothes, and wearing an iconic set of chopsticks in her hair, one bright yellow, the other deep black. Some say that when she hunts spirits and gods, she wields a pair of swords. Some say she uses a bow and arrow. Some say she has a long-lost twin. Because of the overwhelming number of inconsistencies and contradictions within civilians’ stories, official historians have dismissed the supernatural interpretations of General Mi’s second life as public romanticization of a hero. That being said, practitioners and masters of magic and spiritual powers firmly advocated for the ‘alternative identity’ of the general as a separate entity, a legendary figure of her own, twin to General Mi. As studies of magic became more widespread around the world, the stories of the general’s twin begun being taught in classes and textbook. The Pastry Chef, she was called. A hero behind veils, protecting and saving the people in her own peculiar, extraordinary ways. Yet, the outlandish versions and spinnings on the adventures of the two twins continue to run wild amongst the public, fictionalized and dramatized. And it is that inability to determine the exact factual record of what really transpired during that great era that reserves forever a mystical air - a sense of awe and wonder - in the legacy of General Mi and The Pastry Chef.